In the previous article, I explained how to install Avant Window Navigator in Ubuntu Linux (Gutsy Gibbon). By default, it doesn't install any applets. But a dock without any applets is as boring as a desktop without a dock right ? To install these applets you have to enable an additional repository from reacocard. For that open the /etc/apt/sources.list file in your favorite editor and append the following line to it. Now update the repository and install the following package. NOTE: It is assumed that you have already installed the Avant Window Navigator. That is it. Now you can find all the applets in the awn manager which is accessed from GNOME Menu System>Preferences>Awn manager . To run an applet, open the "Awn manager" dialog box and in its left pane, click the "Applets" icon. 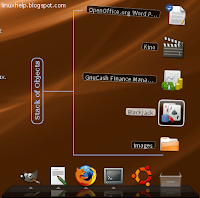 In the right pane, you will find all the applets installed on your system. Select an applet and click the "Activate button". The applet starts running on your Awn dock. Here are a couple of very nice applets which caught my fancy. Dilbert Cartoon Applet - This applet displays comic strips of popular cartoon characters. At present you have a choice of 5 different strips namely - Dilbert, Peanuts, The born loser, Wizard of ID and Xkcd.com. 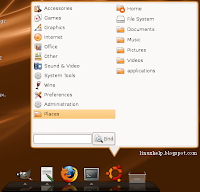 Main menu applet - This applet provides an alternate menu containing all the applications you will find in the menus on the GNOME panel. Stack applet - I like this applet very much. It has three layouts namely "Default dialog", "Curved GUI" and "Trasher GUI". The "Trasher GUI" is the same as the "Default dialog" with the exception that in the former, there is a delete button embedded. The "Curved GUI" is what has picked my fancy and makes me think of the dock found in Mac OSX Leopard. Fig: Click on the stack applet to open a stack of objects. Terminal applet - What better way to use the dock than embedding a terminal into an applet ? The terminal supports transparency which makes it ultra cool. 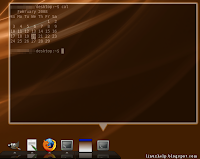 And you can even choose the terminal you want to embed such as gnome-terminal, konsole, xfce terminal, xterm and so on. 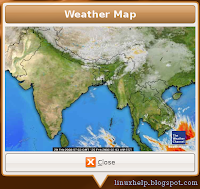 Weather applet - Would you like to know the weather forecasts for today ? Even better how about the predictions for the next 4 days? Well, you have got your wish in the Weather applet. This applet pulls relevant data from the weather.com website and displays it in a nice pictorial view on your desktop. I was really surprised to find my city covered. Also the weather predictions seem pretty accurate. Nice tip, unfortunately it doesn't work for me. libawn-bzr fails to install. apt-get complains that it tries to override a file from libawn. Maybe I missed something but installing the applets package from this location actually demands install of the libawn-bzr package which would break the existing awn and the manager because they use another libawn package, wouldn't it? and it should override and install the libawn-bzr package. Another method is to install the awn-window-navigator-bzr package after uninstalling awn-window-navigator package and this problem won't occur. Thanks..your tips were exactly what I needed to finish out my obuntusx!! That'd be great, but uninstalling avant-window-navigator uninstalls awn-manager, so, although i have all the pretty applets, i have no way to add/remove them. When you install avant-window-navigator-bzr it comes bundled with the avant-window-manager. You do not have to install it separately. So if you have already installed avant-window-manager, uninstall it first and then install the bzr package. mine setup installed well. only problem with AWN and Kiba-Dock. it runs for about 10mns on start-up, then auto quits by itself. I don't have any settings for that. this happens for both the apps. and it seems to do this very quickly if the Dock can hide itself? anyone have a solution? This is a much easier install than any other, and I actually have access to the applets. The last one I want though, to completely rid my desktop of the other deskbars is the notification applet, but all I get is a vertical white line where it should be. Any thoughts as to what's wrong? Thanks for the help! It seems some of the applets are still in a beta stage so some glitches should be expected. I also encountered a similar situation where there was only a white line in the place of the applet. But I figured (atleast in my case) if you wait for some time, the applet eventually loads. Help! I tried to copy those lines into Sources.list but couldn't. I don't have permission for that. Can you give me some advice, please? Why ? i tried to install it. and it was installed but not appear di my desktop. i was configure into System -> Preferences -> awn manager. replacing "vi" with whatever editor you are using. Sudo allows you to run a command under another user, in this case the root user. OK, to sum-up, is it not possible to install awn from universe or backports on Ubuntu AND install applets from one of the PPA repositories. In facts, it seems there is no way to installl applets with Ubuntu repositories, we have to go all to PPA repositories.